This dial has extensive inscriptions in gothic script. 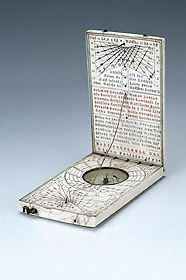 It has a string gnomon dial adjustable for four different latitudes and the inscriptions provide instructions for the user. The declination of the sun is not indicated by zodiac symbols but by the corresponding names. On the outer side of the lower leaf is punched the mark of Hans Troschel and the quality mark 'n' for Nuremberg.